Hello folks! The good people of RUNNR, which incidentally was just recently awarded as “STORE OF THE YEAR” in the last Ayala Malls Mechant Awards (Congratulations, RUNNR! 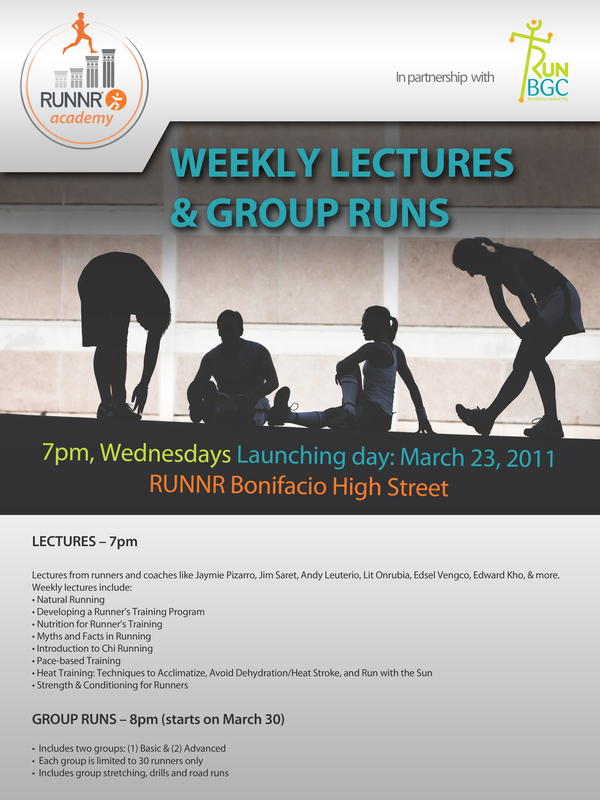 ), brings to the running community the RUNNR ACADEMY – basically a running clinic with a weekly activity that will offer lectures and group runs. Set to be launched tonight, March 23 at the RUNNR flagship store at Bonifacio High Street, the objective of this academy is to educate runners and help them sustain their passion in the sport. Running clinic attendees, which will be accepted on a first come, first-served basis will be grouped into two groups: basic and advanced. Each group has 30 runners each, led by 2 coaches. The running clinic is planned to be offered during the summer season. db 30 pa naman start ng group run? tama pagkaintindi ko. .
napadpad ako dun around 5 at umalis ng 6. . di ko man lang natunugan weee. . .sana maka attend next week. .